Today it’s infinitely faster to get to these treasured Isles than it was back in the days of Captain Cook. However, there are always a few things you can do to make your flying adventure more enjoyable. With this in mind, let me share ten ways to prepare for your flight to paradise. Book the best seats you can afford! I cannot stress this enough. While the upgrade will be more expensive, you will discover that your vacation truly starts when you step foot on the aircraft. 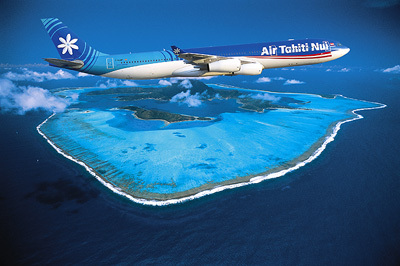 Air Tahiti Nui’s “Poerava Business Class” offers warm and friendly Tahitian service that is as refreshing as an island breeze with French inspired cuisine and spacious seating that reclines 160 degrees. Definitely the most relaxing and enjoyable way to start such a special vacation! However, if the front of the plane is not fitting your budget I totally understand, there are some smart ways to navigate the main cabin. Most importantly book early. The sooner you can let me know your travel plans, the better. Seats are assigned on a first come, first served basis, and not all of them are created equal. The configuration of the planes allows 2 people to sit together on the side without anyone in the middle so you can be comfortably situated together without a stranger in your space. Of course, these seats go quickly to the early bookers! Also, if you don’t mind sitting towards the back, typically planes fill up from the front to rear. This tendency means that if there are empty seats, will often find them in the aft section of the cabin. These empty slots may allow you more room to spread out and stretch for a more comfortable flight and snooze. Instead of thinking about your flight the day before you travel, plan for it “days” before you fly. Tahiti Time (TAHT) runs 10 hours behind Universal Time Coordinated (UTC). 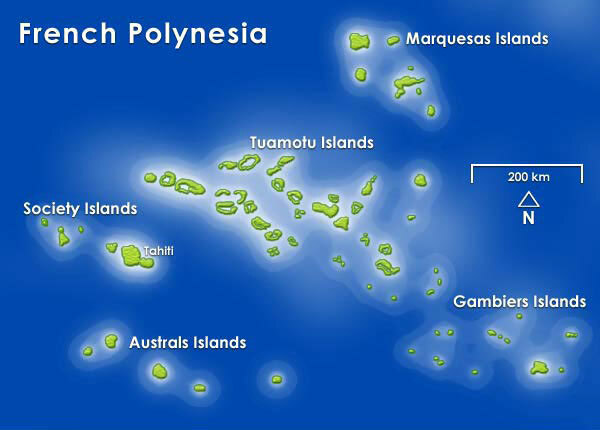 For example, in the summer, when it is 8:00 p.m. Eastern Daylight Time (EDT), it is 2:00 p.m. in Tahiti. Knowing this, you can begin to adjust for this chronological change in two ways. First, start by aligning your bed time and rising times to Tahiti time. Secondly, fix your meal schedule to mirror where you are going. Meals have a lot to do with your overall body clock, and this will help you get into the swing of your destination. Plan your schedule accordingly, giving yourself plenty of time to get to the airport, through security, and to your gate. The old adage, “try to build in enough time to accommodate a flat tire” comes into play here. It highlights the fact that if you pad your agenda sufficiently, you will constantly be on time and have the luxury of enjoying yourself along the way. Make your carry-on bag a workable bundle of fun. Bring your music, books, pillow, tablet, eye mask, noise-cancelling headphones, a few toiletries to freshen up and whatever else is light and pleasurable. hen it comes to clothing, think function, not fashion. Loose fitting, comfortable clothing and easy on-off shoes fit the bill. While you are awake, enjoy your little world. Get lost in the small, trivial details and take pleasure in the things that you usually don’t have time for. 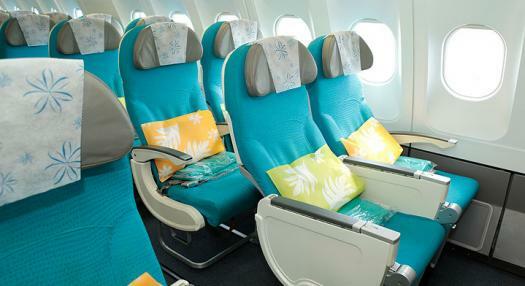 Air Tahiti Nui runs great video and audio entertainment. Make sure you check out the Tiare TV channel where you can get lost in hours of shows that showcase the islands and culture. And the meals served aboard the transpacific flights, even in the main cabin, have a reputation for being very good quality – Tahitian’s love to eat and you definitely won’t go hungry! But again, don’t overeat. Shut the world out with your eye mask and noise-cancelling headphones. Cozy up under your blanket, pull on your turquoise Air Tahiti Nui socks and sink back into your pillow. Your rest time will contribute significantly to how you feel after your flight so you land in paradise feeling refreshed. Not too long ago, the World Health Organization released the results of a study about travel and blood clots. They advised that you should get up and walk around the cabin at least every two hours. While in your seat, try periodically straightening out your legs as far as possible, point your toes back and forth and move your ankles in circles. It’s amazing how the simple act of brushing your teeth can make your entire body feel better. Likewise, antibiotic wipes are the perfect solution when a full shower is not available. Top it all off with a bit of deodorant, and you’ll be well on the way to feeling human again. When you exit the plane and enter customs you are hit with the warm South Pacific air. Consider bringing a change of clothes in your carry-on so you are not overheating in that unair-conditioned customs line and start your trip off in comfy shorts and shirt and sandals – the way you will spend the rest of your vacation. (as a side note – I have a service to whisk you to the front of that customs line if you want the VIP service just let me know!). Regarding the beverage of choice, think water or still, non-acidic fruit juices. Water is always best, and lots of it since the air in a metal tube at 45,000 feet is pretty dry. I always bring a large bottle of water with me onboard as those small cups they provide just don’t cut it. Avoid fizzy drinks since the carbon dioxide gas will only expand and make you feel very uncomfortable. Lastly, as much as most of us enjoy it – avoid drinking alcohol on a long flight. Not only will it cause dehydration, but it also disrupts your ability to rest and sleep. 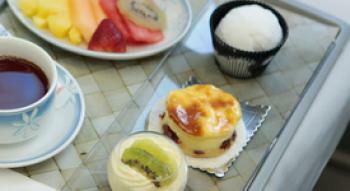 Now that you know how to make a long flight manageable let’s convert your dream into a reality. As a Certified Tahiti Specialist and a leading Tahiti agent in North America, tips on travelling there is just as small part of what I can provide. Having been to every major resort and island, I can help you make your dreams come true – give me a call! This entry was posted in Work with Me, Tahiti, Travel Tips, Flights. Bookmark the permalink.